Nuremburg 1991: half-time. A pal was bawling his eyes out in the toilet. 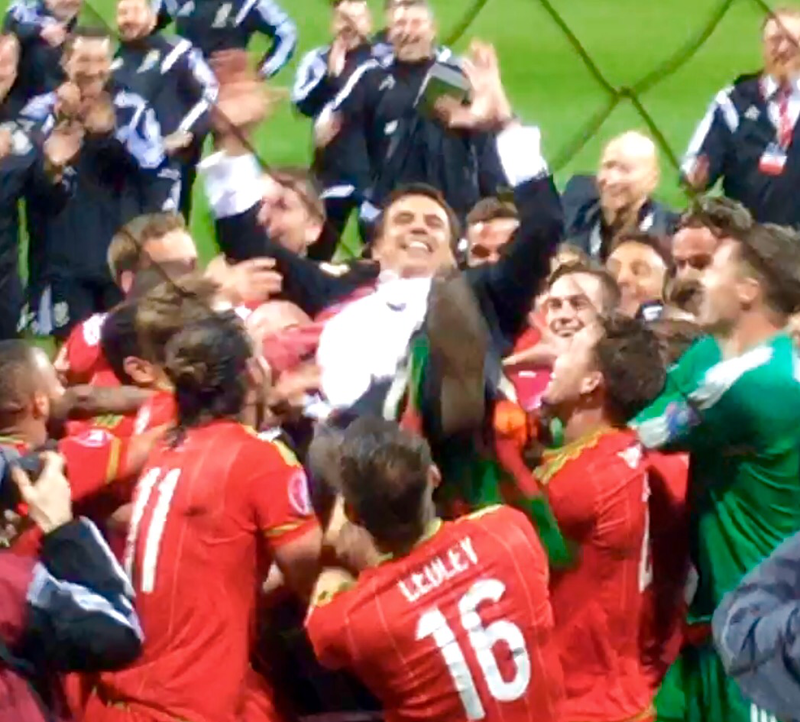 Wales 3-0 down to the Germs and Euro 92 hopes in tatters (only eight teams qualified then, remember). Cardiff 1993: Outside Central station: “Let’s face it, Ade, we’re never going to qualify,” said Chris, a roadsweeper from Anglesey. Haven’t seen him since. This even became a ditty Welsh fans sang, although I always disliked its steadfast, almost proud, acceptance of mediocrity. More a curse than a song. Russia 2003: I became a true believer. My faith was confirmed. That we would never qualify. Never sang the curse though. Zenica 2015: This place, what’s it like? Everywhere you go, stray dogs lie in the streets – mooching like Welsh fans locked out of a pub. Zillions, literally, of conkers all over the place. Bit delapidated. Factory chimney stacks, tower blocks and steelworks dominate the city. And now it’s enshrined in Welsh football folklore along with the usual suspects. Take your pick, here’s mine: Joe Jordan’s arm, the Paul Bodin miss, Rush’s tache, Giggs’s hip wiggle, Robson-Kanu’s extraordinary ordinariness, the volcano that is Craig Bellamy, the mountainous ego of Bobby Gould, the indefatigable National Grid energy of John Robinson. I’ll stop there but I can provide 20 more. Zenica. Sounds like a washing powder. Ninety per cent of Welsh fans were bussed in an hour before the start. They left half an hour after the end. It was not a game, it was an exorcism. Their visit – their transcendental trip lasted three hours, 30 minutes. Four hours tops. Most saw an acre of Zenica, not much more. And it’s not much of a ground. Not much of a game for us either. The real fun came after and what fun that was. We’ve waited a lifetime for that – some more than 50 years. 30 mins – the horrible anxiety of watching Wales kicked in. The hope had come back and, burdened by expectation, fear of not qualifying kicked in – and we did everything to supress that fear. But he Sasquatch Ledley and Joe Allen were proving mightily impressive and it felt like we should take the lead any time. 68 mins – some other bloke – Cyprus two-up. 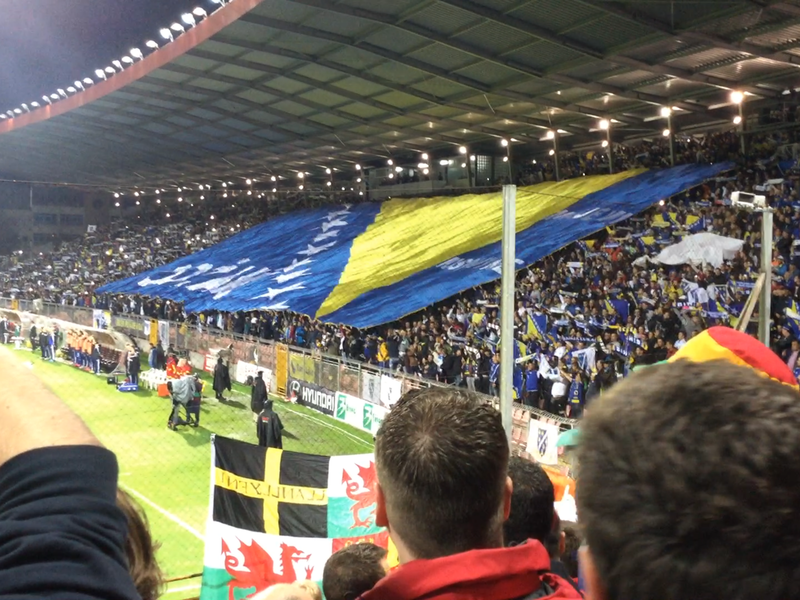 71 mins – Bosnia 1-0. Oh dear. 77 mins – Oh, in Israel it’s now 1-1. Cyprus have one chalked off? No, the berk on 68 mins was wrong. Please punch yourself in the face if you are this person. Save me doing it. 85 mins – Rumbler’s dad now the only reliable source of info. He had God-like status and Rumbler was getting annoyed I was pestering him. I pretty much wanted to phone Rumbler’s dad up and get him to help me through the last five minutes. 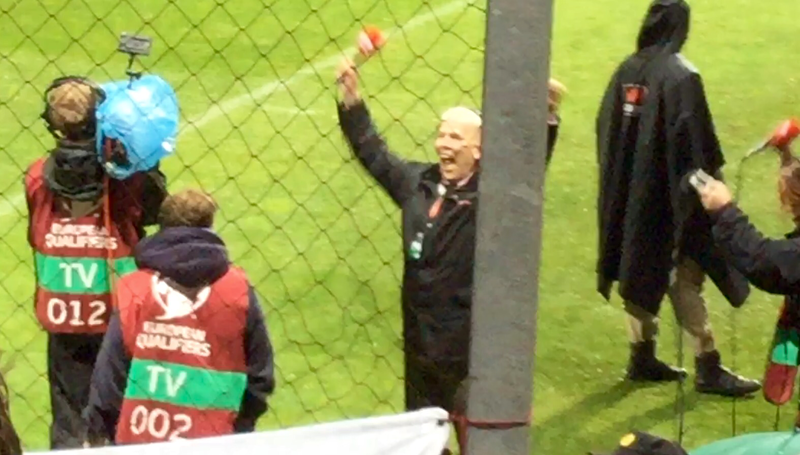 Although, encouragingly the silver fox Bryn Law on the sidelines was grinning madly and seemed to be indicating we were OK and what sounded like 2-1 to Cyprus was broadcast in Bosnian over the tannoy. Full time. 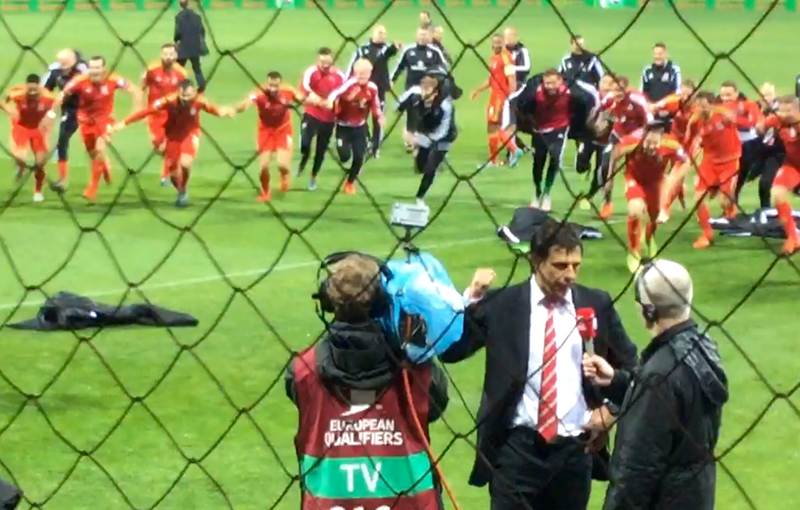 Coleman and Welsh entourage not celebrating yet. But Rumbler’s dad sent what should be engraved on stone and proclaimed the 11th commandment. The words: ‘Israel lose’. I wanted to kiss him. Anxiety attack over. No, make that, lifetime anxiety attack ends. Pandemonium. Zenica was all about the aftermath, not the game. 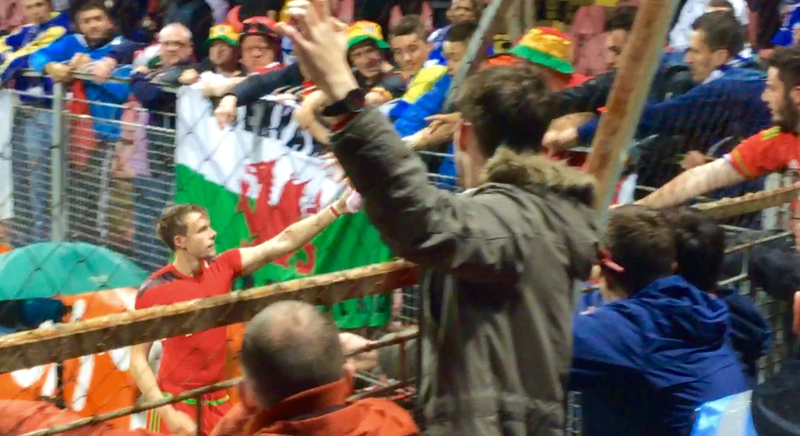 Fans crawled up the net – they looked like stick insects caught in a spider’s web. Stewards tugged at their trousers to persuade the clambering chimps to come down. The guy who bawled in the Bavarian bogs 24 years ago was crying again. Here in Zenica, a place where he saw nothing but a 30-step terrace and viewed a match behind a black mesh, Rhys Boore found his eternal release. 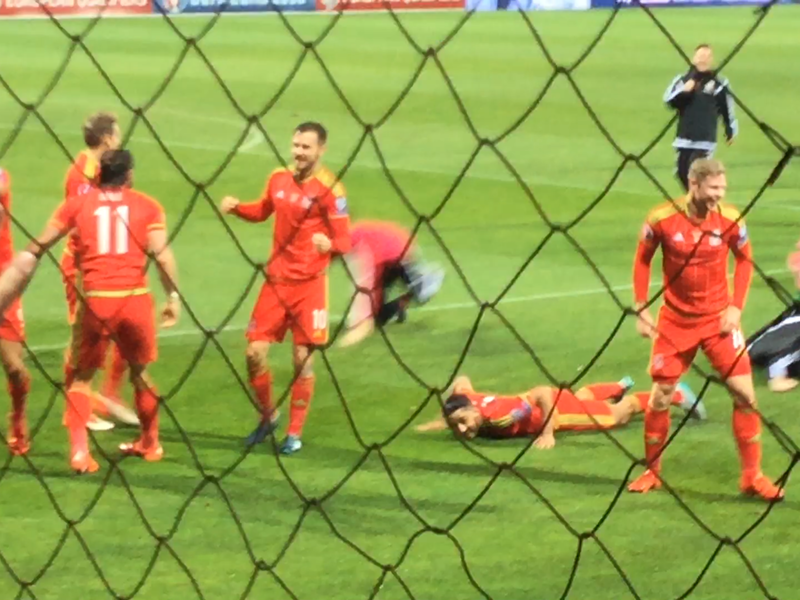 The next ten or so minutes will probably be peak Welsh football joy. Whatever happens at Euro 2016 surely will not top this. There was love, love and love. And then there was more love. It was lovely. Coleman was tossed in the air like a rag doll. What is it about him? The players wouldn’t have done this if Mark Hughes had been manager. Uncle Chris with his Bee Gees teeth, pinky red-white tie, double teapot hands-on-hips stance that I try to channel while fielding for Walthamstow CC and those sulky but sultry looks that snaffled a TV totty wife. Gareth Bale brings his transcendent talent to the team, but supernaturally gifted Uncle Chris brings his own zaniness to the side, unlike no other Welsh manager ever. And this wonderful night in the middle and muddle of nowhere he put the Zen in Zenica. He puts his suit on – special passport pocket has been stitched in – and you know it’s going to rain or snow. It actually started drizzling as soon as we kicked off here and it can only have been his fault. There was a nice touch after all the initial high jinks. As he walked off, Uncle Chris embraced the FAW’s gatekeeper to heaven Lucy Mason – that’s not her official title, she dishes out the away tickets – and another colleague. 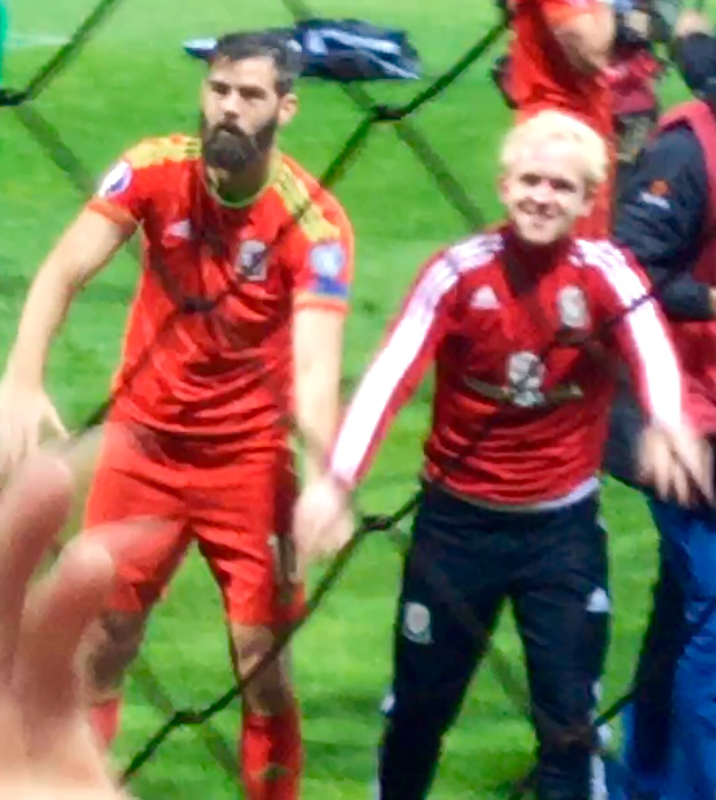 FAW staff had discreetly stayed a short distance away from celebrating players, coaches, stifling their urges to tug the Sasquatch’s beard playfully and shout through the net: “We fackin’ did it!” to the fans they have to endure. Uncle Chris made time for backroom crew. Hugged them all actually. So it looks like this ‘we’re a family’ – always a phrase that triggers eye-rolling scepticism – has validity. Prancing, dancing players were nearly as happy as we were. Relentless, unmitigated ecstasy, unprecedented in our football history. I was fortunate to be at Twickenham for the rugby win over England two weeks ago – this knocked spots off it. The Sasquatch got his moJoe working and he and Jonathan Williams joined hands to pay homage to us fans – Christ, that’s a first, if I hadn’t filmed it I wouldn’t have believed it – as we paid homage to them. Another splendid touch. Fans old and new, youthful and mature, bearded and non-bearded embraced. Those of us who’ve been going so long that everyone – selves included – questions their sanity, sought out old faces, many with tears in their eyes, for a man hug. And then mental manhugs transmitted by the new hotline to Zen that had just opened in the skies above Zenica to old faces not present for whatever reason – Tiny from Holyhead, Phil in Dunedin, Cowboy in Treorchy. Email me for a list. This was for them too. Having watched Germany connect with fans after their games at tournaments and been jealous, it was great to see and feel a real rapport with players. Because after seeing us lose in 6-1 in Novi Sad, you do wonder whether they give a monkey’s. But this monkey’s off our back now. They do care. Ecstasy cannot be faked. New dawn, history made, 57 years of hurt, blah, blah blah. It is indeed a sloughing off of bad habits and an introduction to a brave new world. Where the team lead in breaking new ground, the fans will follow – I saw only one supporter vomit at the ground and I fancy this is a record low for an away match. Afterwards, friends were applauded by locals as they entered the 072 bar after the game. So much for the warnings that circulated before we arrived. Zenica was never the hotbed of hostility it might have been. It helped that we lost of course, but it could hardly have been more welcoming. It was a all-singing, flag-swapping, social media-scouring, picture-sharing, Periscope-broadcasting, croaky-voiced monster of an early-hours shindig. So, Zenica. At 4am I left the centre and turned to look at the city, heading for my hotel called, without irony, Motel San Marino, as if that nation’s mountaintop glamour would rub off on it. There was an eerie yellow-orange flickering light streaking across the sky. Did someone forget to turn the football stadium lights off? No, Zenica steelworks’ chimney, as the waste gases from the smelting were ignited, was emitting a fierce blaze of fire. Clouds of fumes dawdled across the night sky, the city illuminated by the burning furnace. The factory is the burning heart of the fourth-largest city in the country. For one night only it was as if there was a dragon inside. Dog-infested, conker-strewn, smoky-skied, dragon-fired football outpost Zenica. Dog-strewn. Conker-infested. We always felt that if it happened – even though we chastised ourselves for the very thought it might happen and that it would not happen if we thought it would happen – it would happen in a remote place like this. Zenica, middle of nowhere, full of dogs and conkers, Bosnia. Anyway, Zenica, you plug-ugly-but-lovely Port Talbot in the mountains you – tecach yw na’r lili dlos. You realise someone in Wales will name a washing powder, craft beer or puppy after you. 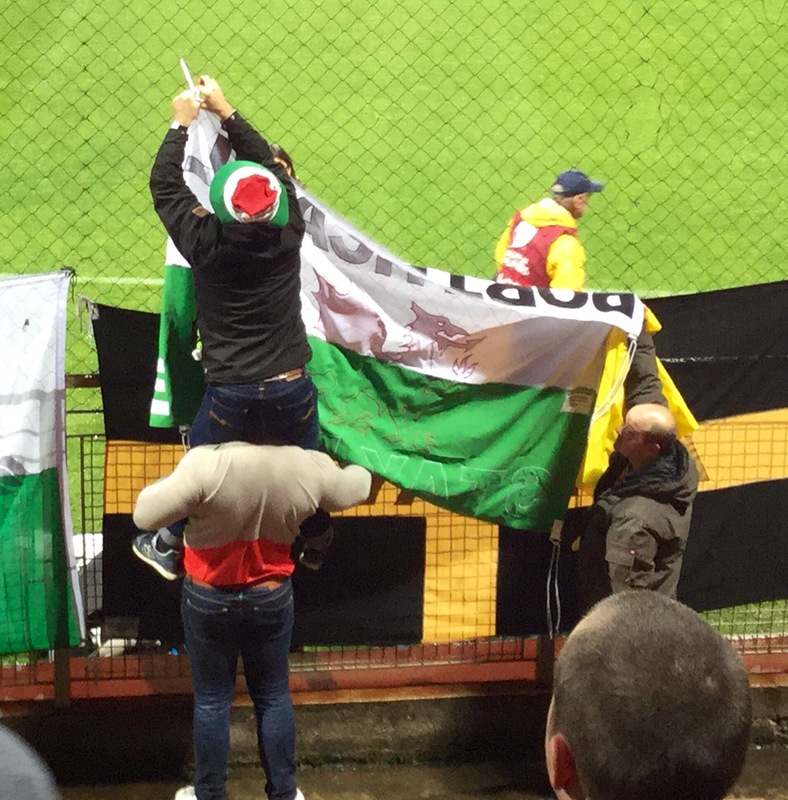 Spirit of Zenica SA – I’ll drink to that. Zenica, I’ll never visit again, but – and heartfelt, mawkish thanks for this and apologies for sounding like Bono on a UN mission – a lot of us finally found something we have been looking for. And we will never forget you. * Fans on the net pic courtesy of Gary Pritchard.